Idle Heroes Super Quiz: How Well Do You Know The Game? How long have you been playing Idle Heroes? Have you really mastered it? Let’s figure it out! Answer all of the questions below to show us how well you know the game! 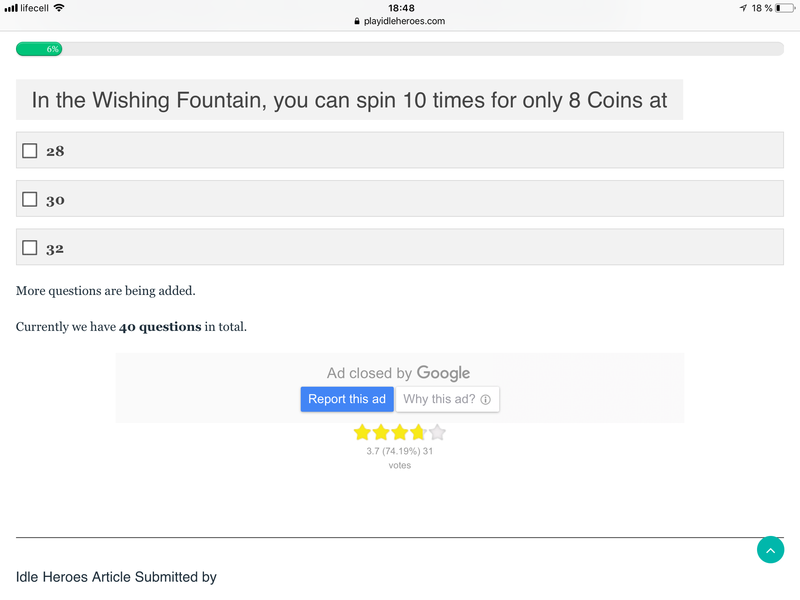 You have 20 seconds for each question. Do not open the game while playing, it’s cheating! Comment down below and show us your results. Also, share this with your friends to see who is the best! How many arms does the Queen have? Who can heal by using the active skill? How many 5* Heroes required to upgrade one to 6* (including that hero itself)? Which of these heroes can't decrease the armor of an enemy? How many Gems can you get from the Daily Quest every day in total? Which artifact does not buff Speed? Which artifact does not buff Crit Damage? How many Gems you can earn by watching Videos every day? How many heroes have a 100% chance to resurrect after they die? Which of these heroes has the highest base HP at 10 Star? Which one below is not a Monthly Event? How many 5* Heroes required in total to upgrade one from 5* to E3 (including that hero itself)? How many Layers does the Tower of Oblivion have in total? Who gets buffs when the enemies use Active skills? How many Wishing Coins can you get from the Daily Quest every day in total? Who can freeze the enemy? How many 5* Heroes required in total to upgrade one from 5* to 10* (including that hero itself)? Who cannot freeze the enemies? How many Arena Tickets can you get from the Daily Quest every day in total? How many Gems does the Monthly Card (Crazy Package) give you each month? Who can't steal the attack of the enemy? How many 5* Heroes required in total to upgrade one from 5* to 8* (including that hero itself)? Who has the 100% chance to silence all of the enemies? How much does the biggest Mysterious Chest (Gem Box) cost? How many Hero slots do you have at the beginning? How many Soul Stones Shards do you get by Disassembling one 4* Hero? How many Soul Stone Shards do you get by Disassembling one 3* Hero? What is the Hero max level? What class is Fat Mu? Which of these buildings is the furthest to the right on the screen? Which Artifact does not buff HP? Who cannot silence the enemies? How many Prophet's Blessings does it require to replace a 4* Hero? Who has the highest base HP at 5 star? Who cannot attack all of the enemies? How Well Do You Know Idle Heroes? Are You A Beginner Or What? Play more buddy, learn more about the game. It's damn fun and you will love it! Wow This Guy Knows Something! Yeah you definitely know something about the game but seems like you are not in game game for too long? Agghhh forget that! We just know that you really love this game since you have so many correct answers and that's insane buddy! Are You Working in DHGames? Why do you know so much about this game? Are you a dev or what? More questions are being added. Currently we have 50 questions in total. You can try again now. There were some mistakes! That’s awesome buddy! Well done! 43/50 after 6 months, that’s not bad ^^. Nice test by the way 🙂 !